To thrive in today’s world of data, knowing how to manage and derive value from of semi-structured data like JSON is crucial to delivering valuable insight to your organization. 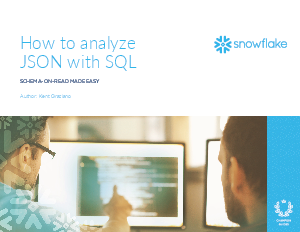 One of the key differentiators in Snowflake is the ability to natively ingest semi-structured data such as JSON, store it efficiently and then access it quickly using simple extensions to standard SQL. This eBook will give you a modern approach to produce analytics from JSON data using SQL, easily and affordably.